No this is not a fanfiction from the darkest, creepy corners of the internet. This is a legitimate publication by Ian Doescher. But first, I am going to start talking about Joseph Campbell. Who is Joseph Campbell I hear you ask? Your geek card is revoked for not knowing this guy! Joseph Campbell was an American writer, lecturer, and mythologist. One of his more famous publication is The Hero with a Thousand Faces which is considered a standard reading for many modern writers and artist (you get your geek card back after reading this work). Campbell did a lot of study on Shakespeare, especially for the aforementioned publication. George Lucas has said flat out in an interview that he use the theories and ideas taught by Campbell and use it for developing his own hero story with his character Luke Skywalker. (Later publications of the book included the self-same character on the cover) For his publication, Campbell did an extensive study on the Bard himself, William Shakespeare. From Shakespeare to Campbell to Lucas, we now come full circle in William Shakespeare’s Star Wars: Verily, A New Hope by Ian Doescher. I am the first to admit that something like this could go really bad (like 90% of fanfiction). So, armed with my library card I check out this book. The picture on the dustcover is something that easily evokes something that could be found in a folio, with Darth Vader peering out to you and his armor styled with an Elizabethan flavor. Take the dustcover off and you find a new book that really wants to be an awesome old book with all the signs of being well worn and read. We are even provided with a Dramatis Personae that includes a chorus. Doescher divided the movie into five acts for his adaptation that surprised me with how well it worked. But let’s get down to what everyone is asking about – what about the dialogue? What really sold me on this was the tongue-in-cheek jokes that only true Star Wars fans would get. I point to Han and his rhyming couplet: ‘I pray thee, sir, forgive me for the mess/And whether I shout first, I’ll not confess.’ Bam said the lady!! There is also a stormtrooper who, while searching of R2D2 and C3PO, orders ‘This door’s locked, move on to the next one,’ which then gets turned into this ridiculous grandiose explanation of how his father told him he could be absolutely certain that nothing of interest would ever be found behind a lock door and has made that his guiding principle through life. That brought to mind when Shakespeare would have these random comedic relief characters just show up say something funny then leave never to be heard from again. Then there are the asides. Here is where we see the brilliance of Doescher shine through. It is here that he gets to delve more into the characters adding levels and depth that might have been lacking in the movie. Obi-Wan Kenobi is a good example of this: he alludes to events in Revenge of the Sith and uses it to explain why he is holding back most of the truth from Luke. He even anticipates his soon to come death and accepts it. This just adds to the final confrontation with Darth Vader on the Death Star making it a dramatic showdown. There is Han Solo’s aside in which we get a glimpse into his reasoning for helping the Rebels at the Death Star at the last minutes. The asides that really take the cake are the ones of R2D2. Yes, R2D2 speaks Basic, and that snarky little droid that we all know and love, shines through. O’er your imagination we’ll hold sway. The great and mighty scene they must portray. Think when we talk of starships, there they be. In the following books Doescher uses different methods besides the Chorus depending on the situation. So overall, I do recommend this book. At this point of writing this review Doescher has ‘translated’ the Original Trilogy to Shakespeare and has recently published The Phantom Menace. I have read all of them. With each publication Doescher has added a lot of thought and consideration and has a better grasp on the whole thing in general. For example, when we meet Yoda in The Empire Striketh Back he speaks in haiku. In the contents of this seires it makes perfect sense. This entry was posted in Fiction, Reviews, Science Fiction and tagged Shakespeare, Star Wars. Bookmark the permalink. 3 Responses to Verily, A New Hope – Say What Now? Ah, yes, Campbell. The picture of the broken clock that’s right twice per day. Assuming it’s not a 24-hour clock, that is. Yes, I have issues with him. Many, many. But he made a good start on the subject of the hero character arc. He just shouldn’t have jumped the shark with the “monomeme.” I have a lecture on the subject. Oh yes, I do. And when I say “lecture,” I mean I lay out how to do a hero’s character arc and also rant about weird mythologists and their theories. 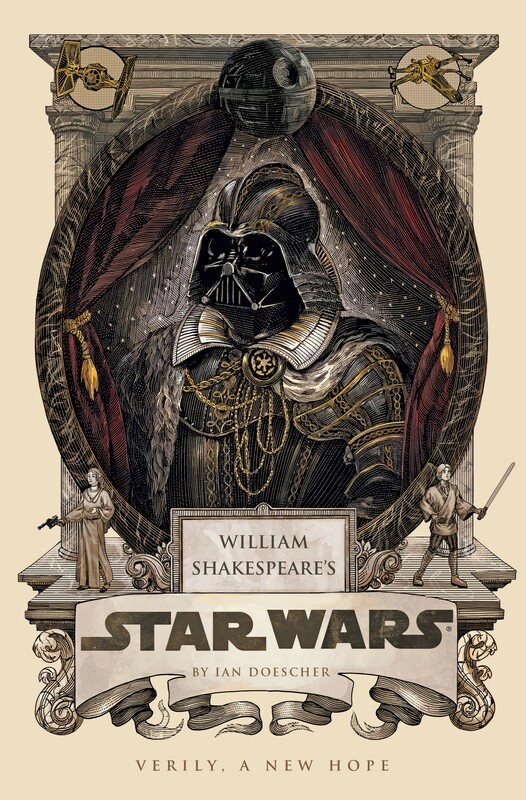 Anyway, all that aside — Star Wars in the original Shakespearean is awesome! The audiobook is well worth getting, because it’s a full cast drama, right down to movie sound effects like blasters, ship engines, and Vader/stormtrooper voice modulation. It’s also a fantastic way to teach Shakespeare. Doescher has clearly studied not just the lines, but the way the lines are supposed to be delivered. The iambic stresses are all in the right place, and the split lines are used the right way. And it’s also fun to see what you pointed out, about how he adapts lines from other plays. For example, when the Chorus says “Think when we talk of starships, there they be,” it’s a direct reference to the prologue of Henry V, which had the problem of trying to portray vast battles; and so the audience was asked ahead of time to help the production out by putting a little extra suspension on that disbelief. I’ve only just started reading this. I’ve always loved Shakespeare and combing it with Star Wars was heaven sent for me. Kismet. We shall see if I enjoy the rest of it. I have been tempted by all the books in this series (he’s up to Episode II now, having completed the original trilogy) but have always held out for some reason – I guess I feared the joke would get old pretty quickly. Sounds like it doesn’t, but only gets better. Thanks for the recommendation!